I am delighted to announce that my memoir of growing up in Ecuador is now available. You can order it now on Amazon at the URL below. I will soon be letting you know how to order it directly from me. For those in the Indianapolis area, a release event and book signing will happen at Global Gifts in Nora. Watch this site for further information. 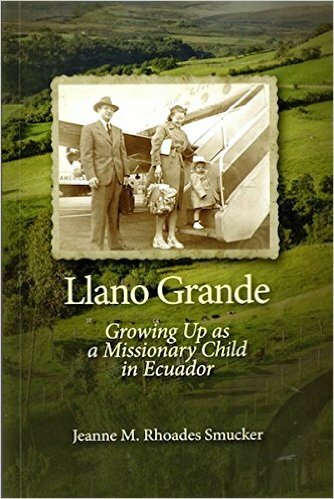 Posted in Ecuador childhood, Llano Grande: The book, Revisiting Llano Grande, Third Culture KidsTagged ; Growing up as a missionary child in Ecuador, Going "home"
I’ll watch for instructions on ordering from you or you publisher. You’ll get more royalties that way, I assume. This is so exciting Jeanne! Both the author’s parents, who were raised in the Church of the Brethren, felt called to the mission field. In 1946 they went to Ecuador to open a new mission in a small rural indigenous community near Quito, Ecuador. The community was called Llano Grande and many of its residents now identify themselves as Kitu Karas and speak Kichwa as well as Spanish. As Christians, the author’s parents understood their call to have a Divine origin. However, I think that it is possible for secular individuals to also feel called based on the situations in which they find themselves. An example of this might be Oskar Schindler, a member of the Nazi Party, who apparently felt called to help save the lives of the Jews he employed during WWII. The author’s parents had grown up on the farm or in small towns in Illinois and Indiana. Moving to Ecuador meant that their children grew up in a very different environment and had different childhood experiences than their parents. On trips back to the U.S. the author remembers about feeling that she didn’t really fit in there. This led her to hide this aspect of her childhood for many years when she returned to the U.S. The book weaves together four story lines. The first is the story of the author’s nuclear and extended families as they meet the joys and challenges posed by the life her parents had chosen. The second, is the story of a childhood friendship that is resumed 55 years later by Mercedes and Jeanne. The resumption of this friendship also gives the author access to the life stories of other members of the Llano Grande community. The final story is the collective story of the community as told to the author by some of its members. The latter is a story of how the community organized to resist exploitation from outside forces and how women organized to deal with the unique problems they faced in the community. I highly recommend this book. The author tells these personal stories skillfully and with unflinching honesty. Collectively the stories present a much needed nuanced presentation of the interface and consequences of the contacts between missionaries and the community in which they live. For me an outstanding feature of this book is last part of the book. In this section some of the members of the community express their evaluation of the efforts of the mission from their perspective of almost fifty years later. Reviewed by Jim Flory – a childhood friend of the author’s whose father was the agronomist mentioned in the book. Jim, Thanks for sharing your experience of my memoir. Of course, you are also part of the story!